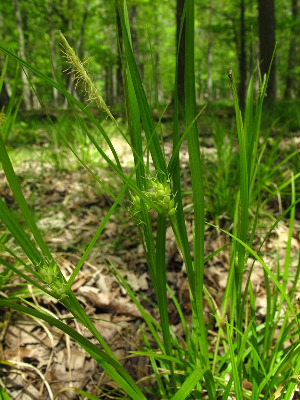 A common species of swamps and thickets, including swamps, depressions and stream banks in oak and beech-maple forests (as well as upland sites); less often in coniferous swamps (cedar, tamarack, spruce, fir), especially along borders, roads, and clearings. Immature specimens with crowded spikes (appearing as if one) might be confused with C. lupulina, from which they differ in having the inner surfaces of the teeth at the end of the perigynium usually hispid; in C. lupulina the teeth are ± smooth within. Depauperate specimens of C. lupulina with mature achenes can also be distinguished, because the achenes of C. intumescens are plump, with the sides elliptic or obovate, while those of C. lupulina have the sides rhombic or nearly triangular. MICHIGAN FLORA ONLINE. A. A. Reznicek, E. G. Voss, & B. S. Walters. February 2011. University of Michigan. Web. 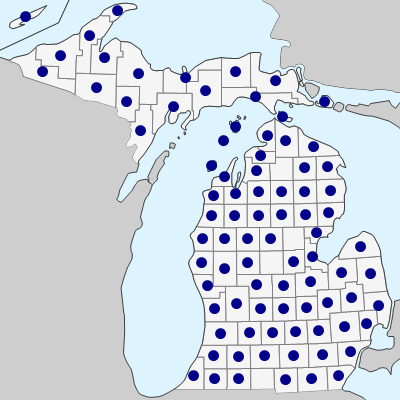 April 19, 2019. https://michiganflora.net/species.aspx?id=986.